Koshertreks organizes and leads treks to extraordinary destinations for people who keep kosher. A trek is a multi-day hike in the mountains. Trekking does not require any technical skills, but does require, at a minimum, that you be healthy and reasonably fit. Each trek is classified according to its level of difficulty. 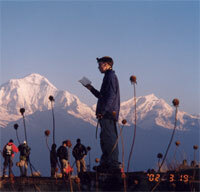 Trekking means traveling light, being self-reliant, and respecting one's surroundings. Personal provisions are carried in a backpack and sleeping arrangements are in mountain lodges/hostels or in tents. "Kosher" first and foremost means that our meals and utensils are kasher and that we observe Shabbat. On another level , "kosher" frames our perspective and the particular trekking experience we offer. Koshertreks does not organize or lead tours that are not treks. While Koshertreks reserves the right to deny participation due to medical or age considerations (according to standards detailed in the description of each trek), it has no restrictions with respect to "level of observance". On the contrary, to paraphrase a (once) famous ad: "You don't have to keep kosher to love Koshertreks!" Yedidya lives with his wife Susan and their five children in Jerusalem. Growing up in New England meant hiking in the White Mountains, the Adirondacks, and Baxter State Park. Since coming on aliyah in 1978, Yedidya has led small groups on treks in the Dolomites, the Rocky Mountain National Park, and across the 350-kilometer Alpine Pass route in Switzerland. He has twice summitted Mt. Kilimanjaro (during which he helped erect what is probably the world's highest eruv), and has guided in the Everest and Annapurna regions of Nepal. Former assistant director of the Pardes Institute of Jewish Studies; currently serves on the Board of Directors. Yedidya had been on treks through a number of the world's great mountain ranges - including several with his family. Having coped with the challenge of observing kashrut and Shabbat on these treks, he realized that many among the kosher-observant community likely don't even consider trekking due to the various halachic issues involved. Even if one did address these issues, doing so within a "non-kosher" group would be difficult and uncomfortable. The situation therefore called for a kosher treks operator to step in, with the mission of handling all the halakhic logistics in a way that would open up the great mountain passages to kashrut-observers. Hiking through these passages- both in Israel and abroad- has been among our most formative personal and family experiences. We are always inspired by the mountains' majesty; challenged by the traverse of winding trails and high meters; and uplifted in the afterglow of a journey's completion. A Jewish perspective has framed these journeys. It has presented (surmountable!) logistical challenges, but more importantly, has given us a better sense of our place in this world, and a better understanding of the essential role that the mountaintops have played, both literally and figuratively, throughout our biblical heritage. It is our vision, then, to bring together derekh eretz im tora, that is, "the way of the land", with Torah. I've always loved the mountains, felt at home there. They put the world into perspective. When hiking, I try to carry as little as possible, only as much as I really need. This somehow carries over to other, non-physical realms as well. Being with family, friends, or even complete strangers is simpler and less encumbered, focused as we all are on the natural splendor around us, and on the straightforward task of helping each other reach the next station of our journey. Prayer, too, never uncomplicated for me, is somehow less burdened there ("because we're closer to G-d," my son once joked). Several summers ago, hiking in the Alps, my five children, wife and I were caught in an unseasonably heavy downpour. Despite our raingear, we were soon quite wet and cold, and several hours from the nearest refuge. Trudging along through ankle-deep mud, we came upon an isolated alp (a small, stone hut where the Swiss make cheese), and thinking (hoping, really) that it perhaps was an unmarked hostel, knocked on the door. We were greeted with gracious smiles by a young couple and their toddler who had come for the summer to help the elderly owner of the alp produce his cheese. No, it was not a hostel, they explained, but "you must come in and drink some hot chocolate". Soggy and rather demoralized, we eagerly accepted their offer. We sat on their beds (we were many and the alp was small), sipped our hot drinks, warmed ourselves next to the stove, and watched how cheese is made (it's not so simple). We sat for some time, perhaps an hour or so, until the rain started to let up. "You really should stay," they urged, " they say there may be snow." We demurred, as we had to move on, but insisted that they take payment for the refreshment (it's amazing how much hot chocolate and tea seven cold and damp people can consume). They adamantly refused. "That's why we're here," they said. � All content and photography within this website is copyrighted and may not be reproduced without the express permission of Koshertreks.